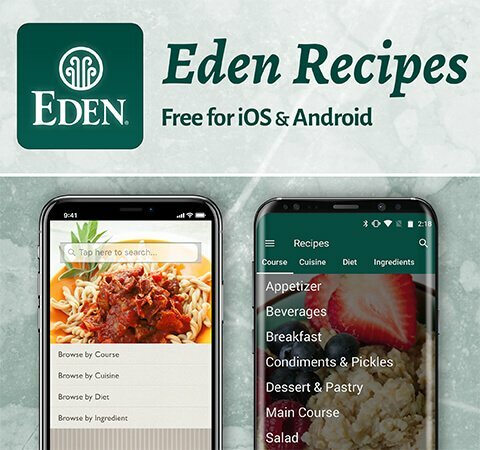 Eden Aduki Beans are U.S.A. family organically grown by those dedicated to cleansing the environment and producing the best tasting, most nutritious food. Decades organic vital soil gives us much more vital beans that contain more minerals and allows us to cook them without, what we consider toxic, 'processing' chemicals. Aduki beans Phaseolus angularis are one of Japan's most popular beans. In 1974 Eden's President traveled to Asia and purchased a shipment of these small red beans at the direction of Noburo Muramoto, author of Healing Ourselves. Shipped down the St. Lawrence River, half the load was dropped in Toronto and half in Detroit. These beans were the seed for our growers and initiated the commercial cultivation of aduki beans in the Western Hemisphere. Eden Aduki Beans are expertly prepared at our certified organic, kosher cannery in east central Indiana. They are washed, soaked overnight, and thoroughly cooked with a bit of kombu sea vegetable. You don't taste the kombu, but its natural glutamic acid softens and enhances the flavor of beans. All water that contacts Eden for washing, soaking, and cooking is purified water. 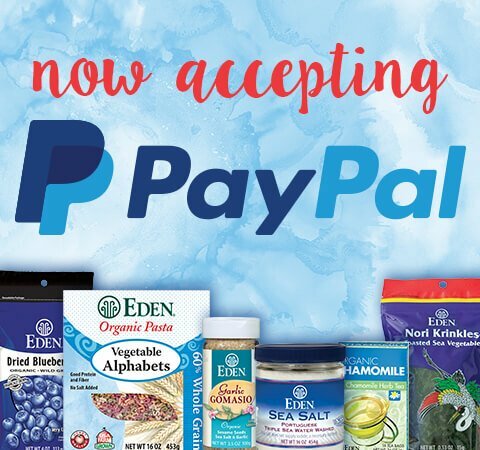 Eden Beans received high praise in the January-February 2009 Nutrition Action Healthletter, the third time Eden have been complimented by this respected Healthletter. Twelve varieties of Eden No Salt Added Beans were acclaimed for being naturally very low in sodium without the refined salt added to most commercial canned beans. 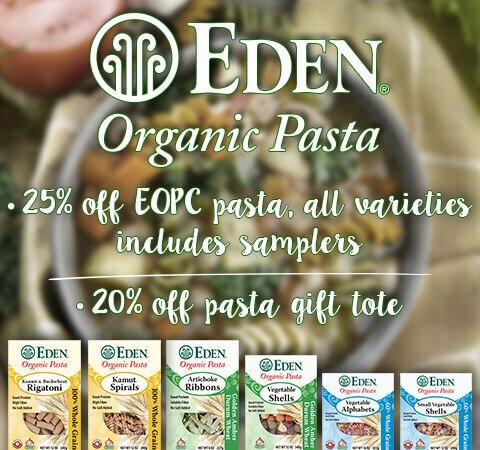 Nutrition Action Healthletter noted that Eden are firm, not too soft, and that all Eden bean cans are bisphenol-A free. According to the FDA, "Low fat diets rich in fruits and vegetables (foods that are low in fat and may contain dietary fiber, Vitamin A, or Vitamin C) may reduce the risk of some types of cancer, a disease associated with many factors," and "Diets low in sodium may reduce the risk of high blood pressure, a disease associated with many factors." Eden Aduki Beans are very low sodium with no salt added, fat free, and an a good source of protein, fiber, magnesium, and zinc. Adukis are a compact, deep red bean with pleasing texture and flavor. Adaptable to any ethnic cuisine they're great for Red Beans and Rice and a perfect complement to quinoa. Also known as azuki or adzuki beans, they are highly regarded in macrobiotics as a balancing and strengthening food. 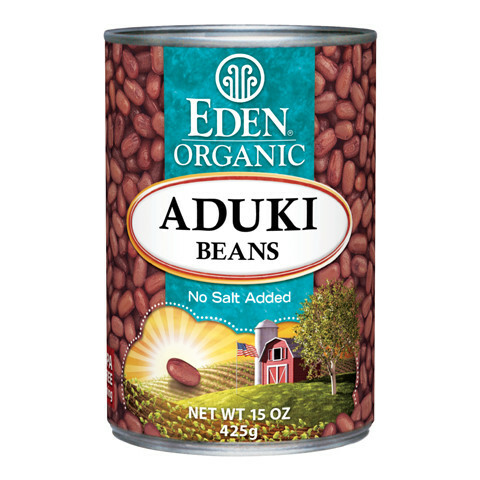 Eden Organic Aduki Beans are delicious in soups, dips, and spreads. They're great with winter squash, sweet corn and other sweet vegetables, and perfect with brown rice. Try them with a touch of ginger added, or make Aduki Ginger Dip and serve with vegetables and Eden Chips. Search under Aduki in our free recipe section for this and other tasty recipes.